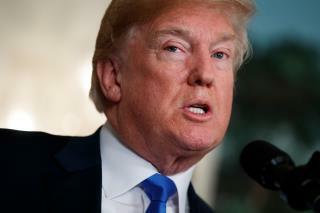 (Newser) – President Trump's administration on Sunday appeared to back away somewhat from threats of tariffs on China as global fears of an escalating trade dispute continued to rattle world markets. Per the Wall Street Journal, officials noted that penalties are not imminent and that China would ultimately choose cooperation rather than be forced into it. President Trump personally addressed the issue on Twitter Sunday. "President Xi and I will always be friends, no matter what happens with our dispute on trade," Trump wrote. "China will take down its Trade Barriers because it is the right thing to do. Taxes will become Reciprocal & a deal will be made on Intellectual Property. Great future for both countries!" As the AP notes, Trump did not explain why, amid a week of economic saber-rattling between the two countries that shook global markets, he felt confident a deal could be made. What if "shaking" the markets was his ultimate purpose, so criminal yarmulke wearer Jared could take financial advantages and take himself out of his humungous debt? The draft dodging hustler is being outhustled by an individual much smarter than he!